Is the home sufficiently baby-proofed? Whether you are a first-time parent or a many-time parent having a new baby in the house can be daunting. Baby and toddler-proofing your home is an important step in keeping your child safe, but it can be overwhelming to think of everything. 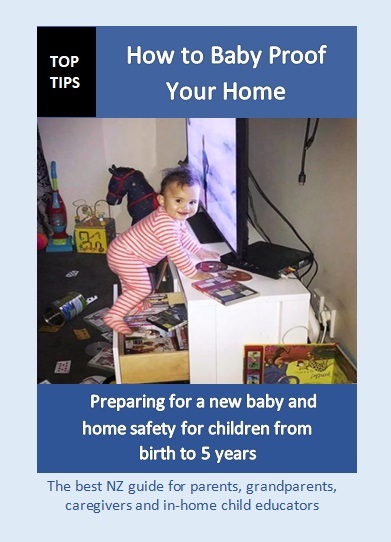 This book offers practical tips on ensuring your child is safe and covers numerous aspects of home safety, that although seem obvious, you might miss. The first section is handily divided into ages and stages, so you can see at a glance what you might need to deal with depending on your baby’s age, while the second covers a range of useful areas including sleeping, changing and feeding. There is also a section for older babies and toddlers who are becoming more active and daring in their explorations. A must for all parents-to-be, this book is a handy guide to have both before baby arrives and as your child grows through their early years. Full of practical advice that you can easily implement, this book will help you prevent accidents and injuries while still allowing your little one to explore their surroundings and develop their skills. Direct credit to: 06-0529-0922216-00. In the details line put in your name to show the payment has been made by you. Or pay by VISA card (note that a $1.00 processing fee is added automatically for visa card payments). Type in your email address below and click on the "Buy Now" button to go through to the secure paypal website. Your order will not be sent until payment is received.